Blue Medusa? I thought that my daughter would make more of a cute and somewhat graceful medusa rather than an authentic cursed green monster. 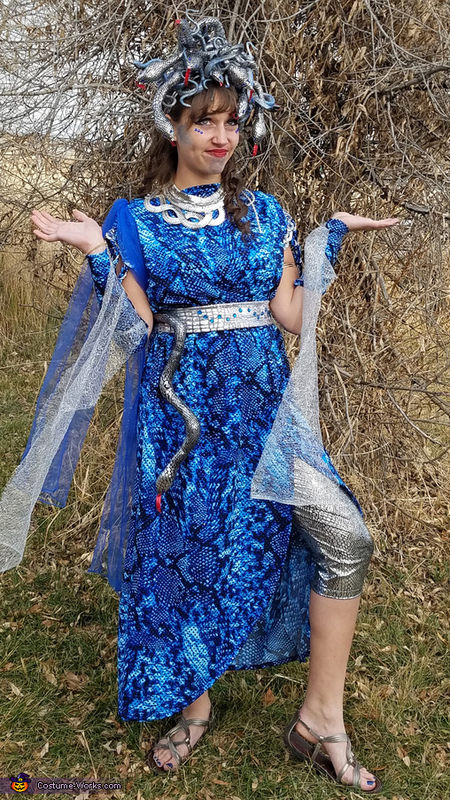 I made the dress (royal blue) and snake pants (silver) out of snake print spandex. I braided matching material tubing and silver cording to add to the sleeves of the dress and sewed a blue scarf to the back. I designed some arm warmers to match with sparkly silver sheer material draped out from them. I designed a silver belt with jewels and a long slithering snake. I spray painted plastic snakes silver and then sponge painted them blue and turquoise in areas (I painted the eyes and tongues red). I sewed silver spandex snakes and heads with blue jeweled eyes and red tongues and weaved and attached them in. I asked my husband to buy a baby rattle for the snake noise. He came back with a really cool rattle that I covered in the dress material and gold and black trim. I purchased a red flute at the local dollar store. I bought a necklace, a snake arm band, and snake bracelet. I also posed her with a rock bunny I had painted years ago. She thought it would be great if we had a real bunny for the before and after effect. We painted her nails blue and then put a coat of silver sparkle polish over the top. For her face, I used some Halloween makeup. I put 3 shades of blue on her cheeks and chin. I put netting over her face and sponged some snake scales in a few places. I arranged six blue jewels below her eyes using eyelash glue to secure them in place. She wore a messy bun in her hair with blue rhinestone jewels and curly long ringlets. She won her school Halloween costume contest. It took about a week to make and the cost was about $75.00.